If timing is everything, then the Centennial Global Business Summit in mid-October was a scheduling tour de force. Two years in the making and the culmination of HBS’s yearlong centennial observance, the three-day event was designed to galvanize thinking and action around the 21st century’s transcendent business challenges. What no one expected, but what dominated the event, was the biggest financial crisis since the Great Depression. As 2,000 alumni convened on campus Monday, October 13, the U.S. stock market soared to its biggest one-day numerical gain since 1933, following on the heels of an 18 percent decline the previous week, the worst such drop in the Dow’s 112-year history. The next day, Treasury Secretary Henry Paulson (MBA ’70) announced a plan to inject $250 billion into the nation’s banks, a painfully ironic twist for a free-market Republican administration, signaling a turning point in postwar American economic history. Against this backdrop of historic events, keynote speeches, discussion panels, and more than three-dozen breakout sessions served to sharpen participants’ focus on the summit’s agenda: profound and fundamental questions regarding leadership, globalization, and market capitalism. Just how to make a difference dominated the leadership discussion that opened the summit on Monday. The topic was taken up by this year’s Alumni Achievement Award recipients, who weighed in on the current economic crisis but quickly moved on to advocate for energy independence and cross-sector cooperation between business and government. 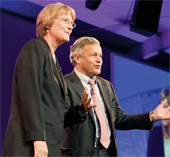 The panel featured John Doerr (MBA ’76), Jeff Immelt (MBA ’82), Anand Mahindra (MBA ’81), Meg Whitman (MBA ’79), and James Wolfensohn (MBA ’59), and was moderated by PBS’s Charlie Rose. Immelt, CEO of GE, described his outlook as generally optimistic. Once the crisis is resolved (and, he remarked, “the government always wins” in these situations), the United States can expect at least two quarters of negative growth. But with the right levels of liquidity, the economy will come back, he said. “Forty or fifty years ago, the great advantage held by the United States was its wealth; what will save us now is technology and innovation,” added Wolfensohn, chairman of Wolfensohn & Company and former president of the World Bank. Creative Capitalist: In his conversation with HBS professor emeritus James Cash, Microsoft’s Bill Gates explained how he uses philanthropy to address market failures in global health-care delivery and education. 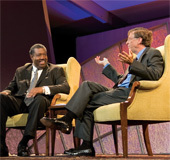 As an example of the sort of cross-sector cooperation he favors, Gates pointed to the foundation’s work with GlaxoSmithKline on a malaria vaccine. “It’s an idea that I sometimes call creative capitalism,” said Gates. “But it’s not just about dollars. It really is about the innovation power” that American businesses could unleash by allowing their most creative and innovative people to spend 5 percent of their time working to solve social problems. Ignore history at your peril: HBS professor Niall Ferguson, an economic historian, declared that a global economy is more likely to create economic crises than a nonglobal one, and that government intervention in financial crises often has unintended bad consequences. The summit’s second keynote speaker, HBS professor Niall Ferguson, an economic historian, brought a sobering perspective to the topics of globalization and market capitalism. Both, he argued, are inherently unstable. But that doesn’t prevent people from being surprised each time an economic crisis erupts, something that has happened with regularity. Nor does it stop governments from intervening at the risk of doing more harm than good. Few, it seems, learn from the lessons of history. In Ferguson’s view, the real strength of globalization is the way it wrings inefficiencies out of everything from manufacturing to capital markets and even services. Paradoxically, the greater the global system’s efficiency, the greater its fragility. Herein lies the Achilles’ heel of globalization, said Ferguson. “Almost everyone who talks about a flat world doesn’t realize that it is over-optimized to the point of maximum vulnerability,” he cautioned. Hence, a global economy is more likely to generate economic crises than a nonglobal economy, an inconvenient fact of economic life. 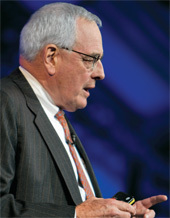 Turning his attention to the nation’s current financial crisis, Ferguson noted that such episodes “are much more frequent than we expect them to be.” Over the past 100 years, the S&P 500 has ended the year down 20 points or more on seven occasions, including this year. While it’s human nature to believe that the unthinkable, such as a collapse of U.S. housing prices, cannot happen, human calculation also comes into play. Ferguson faulted widely used mathematical risk models for failure to build in historical data reaching back more than five years. “The problem with only five years of data is precisely that it will lead you to miss the next big crisis,” he said. Taking historical perspective to another level, Ferguson compared evolutionary developments in the natural world with recent developments in the global economic system. Over the past two decades, he explained, there has been an “incredible financial evolution,” from the proliferation of private equity and hedge funds, to the deployment of all sorts of derivatives and collateralized debt. However, a crucial difference is that in the natural world, events that disrupt evolution are random. The asteroid that hit the earth and caused the extinction of the dinosaurs was not the dinosaurs’ fault, Ferguson wryly noted. In contrast, “we cause disasters that happen to ourselves,” he said. But there’s a built-in tension between having the state protect businesses from failure and allowing financial evolution to take its course, resulting in moral hazard — the fear that a party insulated from risk may take more risk. “It’s not clear how you solve that problem,” Ferguson said, noting that it is a topic that commands considerable attention in HBS classrooms. Another problem is that new financial regulations imposed after a crisis occurs may “impede the process of natural selection that is essential in a system of economic evolution,” he explained. “It is never good when the state intervenes to the point that it essentially controls a financial system and makes bankruptcy a near impossibility.” Citing Harvard economist Joseph Schumpeter, Ferguson observed that the process of “creative destruction” is the essential fact about capitalism. The lesson not to be overlooked, he warned, is that government interference with this natural selection process could impede the innovation that is the lifeblood of modern capitalism. Taking Part in the Conversation: Summit participants spent half of their time in more than three-dozen breakout sessions that focused on globalization, market capitalism, and leadership topics. The flip side of government intervention is government paralysis, the topic that resonated most deeply with the alumni audience Tuesday morning during a second panel discussion on leadership. Moderated by HBS professor Nitin Nohria, the panel included Jamie Dimon (MBA ’82), chairman and CEO, JPMorgan Chase; Orit Gadiesh (MBA ’77), chairman, Bain & Co.; Rick Wagoner (MBA ’77), chairman and CEO, General Motors; and Jaime Zobel de Ayala (MBA ’87), chairman and CEO, Ayala Corporation in the Philippines. As for politicians, Dimon railed against their inability to take action even in the light of compelling rationales to do so. Energy independence has been a national priority since 1974, but “we don’t have the fortitude to tax oil, or to tax BTUs,” he said to sustained applause. As a result, he continued, “We deserve $4 a gallon gasoline.” Too often, he continued. government proposes solutions that appeal only “to the madness of the crowd,” letting complex issues such as energy independence go unresolved. “Between their corruption, their stupidity, and their playing to the crowds,” our political leaders have failed us, Dimon said, to another round of applause. “Where are the grown-ups?” asked Gadiesh, referring to the lack of 21st-century institutions needed to lead in government and business. Zobel described how wealth disparities in the Philippines create popular distrust of large businesses. He has found that to be successful, he must work closely with local communities, both out of pragmatism and because it’s the right thing to do, an instructive example for U.S. companies as American public opinion sours on certain elements of the private sector. Saving capitalism from itself: University Professor Lawrence Summers said the global system must become stable and equitable. 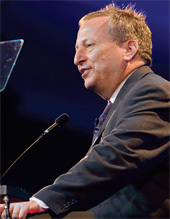 Market failures framed the Tuesday keynote presentation of University Professor Lawrence Summers, treasury secretary in the Clinton administration. Directing his remarks to the unfolding economic crisis, Summers said the challenge ahead is to create a system that maintains and shares stable prosperity and economic growth equitably and globally. Pointing to the rise of massive wealth inequality in the United States in recent decades, Summers said that in any society, equitable income distribution goes to the heart of a society’s legitimacy, fairness, and opportunity for its citizens. In the United States, he said, the top 1 percent of earners gained $600 billion annually in income while the bottom 80 percent lost that same $600 billion from 1979 to 2008. That translates into an average gain of $500,000 in annual income for each person at the top, while the bottom 80 percent lost an average of $8,000 annually. Another challenge for America is to recover from recent setbacks as a “hard power,” as a moral beacon, and as an economic leader, said Summers. And the energy problem, he emphasized, must be dealt with: “The current path, sustained, does not work geopolitically or environmentally. Summers then moved on to a panel with Sir Ronald Cohen (MBA ’69), a founding partner of Apax Partners and a social-venture entrepreneur, and HBS senior lecturer Thierry Breton, former finance minister of France. With University Professor Michael Porter moderating, the conversation about the future of market capitalism continued. Porter set forth what he called an “agonizing dilemma”: While capitalism’s wealth creation is essential, the fears and insecurities it creates, exacerbated by globalization, lead to political pressures to intervene in markets and often hinder their effectiveness. Cohen responded, “Market capitalism is going to be judged by our reaction to the human problems that this crisis causes.” Breton noted that many in France were angry about rescue packages for banks when ordinary people received no help and were losing their businesses. Summers acknowledged the importance of social entrepreneurship but emphasized that business should not view it as a substitute for broad public-policy measures that reach all citizens. 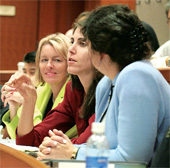 PEAK PERFORMANCE: HBS professor Warren McFarlan worked tirelessly behind the scenes to plan and organize the summit’s timely and memorable program of speakers and panel sessions. Inside the summit, unabashed champions of free markets and government deregulation would have found the atmosphere more than a little unsettling. The biggest applause lines followed criticisms of business and government for failure to act more forcefully on behalf of the public good, whether dealing with income inequality, energy policy, or market regulation. Above all, the need for leadership framed every keynote address, every panel discussion, and every breakout session.